There is always something happening at the Trail City Bed and Breakfast! Trail City Bed and Breakfast is pleased to provide you another quality facility. 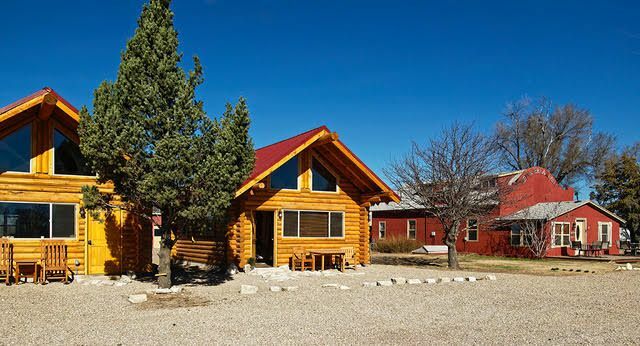 We now have two log cabins ready for occupancy. Please follow the reservation link to reserve your stay today! Welcome to Trail City Bed and Breakfast and Coolidge, Kansas! We’re glad you stopped by. Our goal is to provide you a one-of-a-kind vacation experience. We’re proud of our town, historic sites, history and attractions which all add up to make Coolidge Kansas a great vacation destination. Whether your visit is for business or relaxation you will find our rooms and amenities just what you need for a peaceful nights rest. We can help you identify local attractions to showoff the area and provide you a full Coolidge visit. If you enjoy bird watching – we have birds. If you enjoy fishing – we have fish. If you enjoy historic sites – we have them a plenty. If you enjoy Geocaching – then stay with us and get ready to have some fun! One of the best overnight experiences ever. The evening snack was delicious and the breakfast outstanding! The room was clean and with excellent facilities. The bonus was several hours of exchanging stories about the unique 19th and early 20th century history of the area. By the way, we couldn’t find any of the bullet holes in the ceiling from that 19th century bar fight. Mary and I wanted to let you know how much we enjoyed our stay at Trail City B & B. We were very impressed with the cleanliness and the wonderful breakfasts. We will surely try to stay there again and hopefully take advantage of the bicycles. Thanks again for being such a great hostess. I see you are interested in the history of Trail City. I am president of the Dodge City Trail of Fame in Dodge City and we, too, have a strong interest in preserving that history, especially as it relates to “Print” Olive who is interred in Maple Grove cemetery. Today I happened to meet Mr. Vic Fisher who apparently owns the land the city occupies. In talking with him we discovered that he would like to see the site/history preserved as well. I will be contacting the Kansas State Historical Society (whom we have worked with in the past) in an effort to find a way to curate and preserve the site and its history. I would be very interested in any information you might have including pictures, drawings, legal property descriptions…etc. I believe we can also bring the Wichita State Anthropology department on board at some point to do excavation and preservation. State and Federal funds are often available for well documented and prepared projects like this. I am a retired meteorologist living in Dodge City and my wife, Carolyn, is an archaeologist. Please feel free to contact us at your convenience and lets see what we can come up with. Dodge City Trail of Fame, Inc. This is a wonderful place to relax and not to mention out of this world hospitality. We were truly blessed to be able to stay the night here. Thanks to Lori & LaRue Lennen! My great grandfather was Stephen N. Canfield and he owned a hotel in Trail City that I have been told was later moved Coolidge. I was wondering if you knew who the owner of your building was when it was still in Trail City? Staying at the Trail City B&B was such a comfortable experience. Great room with private bath and great breakfast, especially the homemade french toast covered with corn flake-coating, strawberries, powdered sugar! Lori knows when to visit, when to let you be and her passion for Coolidge helps you get to know this small town. I highly recommend a stay here!